The inn has an open kitchen, spacious living areas and a balcony overlooking the main avenue. We provide complete tourist information in English and Spanish and we can schedule many tours that the city has to offer. Hostal Tamarindo Inn's location is excellent; just a few blocks from Parque lleras, the metro station, shopping centers, museums, nigh clubs and more. We are in the El Poblado neigborhood of Medellin. It is a lively area of town, well know for its night life. We are on a second floor, we are not wheelchair accessible, sorry. Common kitchen facilities and dining area are featured. Check in time start at 14:00 to 22:00 . Check out time is 11:00 . Payment upon arrival by cash, credit cards, debit cards.This property may pre-authorise your card before arrival. Colombians and foreign nationals residing in Colombia must pay the 16% IVA tax. Hostal Tamarindo Inn is pet friendly. Children are welcome. Spanish only. Great kitchen but it is not a hostel, more like a cheap hotel. A busy street right in front. 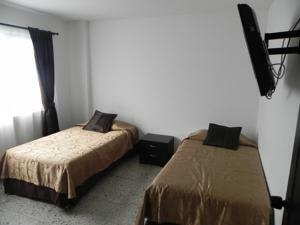 Location is pretty good, you can reach everything in El Poblado and it is near (10 min) to the metro station.